On 16th November 1528, Marguerite of Angouleme gave birth to a baby girl named Jeanne in Saint-Germain-en-Laye. Her husband was Henry II of Navarre, ruler of a small kingdom situated between France and Spain. The kingdom was also a refuge for French Huguenots persecuted in their home country. Jeanne too was a Protestant. Despite being educated in Catholic France, she was raised by a father who didn’t care which religion he practiced and a mother who was symphatetic to the Reformers. And as an adult, this princess who when born, seemed only destined to marry and beget an hair, would become a leader of the Huguenot party. A short and frail woman, with light eyes and thin lips, she had an enormous inner strength and a deep faith in God, on whom she relied when things seemed hopeless. Jeanne was also very intelligent, brave and austere. She could be very vehement and sarcastic when she spoke. In 1541, when Jeanne was only 12 years old, she was forced to marry William, Duke of Jülich-Cleves-Berg and brother of Anne of Cleves. This marriage was against her will, and Jeanne, a stubborn and high-spirited princess, kept protesting until her wedding day, when she had to be bodily carried to the altar! The marriage, however, doesn’t seem to have been consummated and, four years later, when the alliance with Germany was no longer necessary, it was annulled. It was now time to find her another husband and the choice fell upon Antoine de Bourbon, a French prince. Antoine was goodlooking, charming, a good soldier and could become King of the country if the ruling dynasty of Valois didn’t produce any male heirs. This union seemed to be much happier, at least at first. Although her husband had extramarital affairs, Jeanne cared for him and gave him 5 children. Only two of them, Henry, future King of France, and Catherine, survived childhood. The problems started when, in 1555, Henry II died and Jeanne and her husband became joint rulers of Navarre. On Christmas Day 1560 her conversion to Calvinism, which was now declared the official religion of the kingdom, was announced. Catholicism was banned, its clergy banished and its churches destroyed. However, those who didn’t embrace the new faith weren’t punished, unless they rebelled. At first, her husband seemed to accept her decision but when the French Wars of religion broke out in 1562, and the Spanish King hinted that he could receive the Kingdom of Sardinia if he chose to support the Catholics, he changed sides and threatened to repudiate his wife. The couple separated but later that year Antoine was killed at the siege of Rouen. Her son Henri, who would one day convert to Catholicism uttering the words “Paris is well worth a mass”, was now in line to the throne. 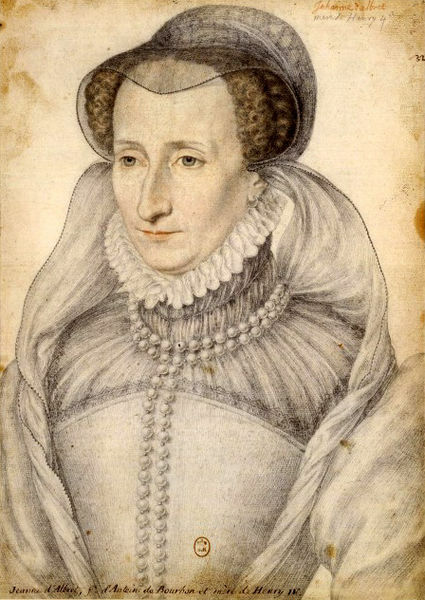 Jeanne instead kept fighting for the Huguenots throughout the three civil wars and her contribution was invaluable especially in the third one, which broke out in 1568. She asked for aids to foreign sovereigns, offered her jewels to raise money, wrote manifestos and took care of the refugees and even inspected the troops during fights. Finally, peace was reached in 1570 and, thanks to Jeanne’s negotiations, the Huguenots were granted several liberties including being able to practice their religion in France, except in Paris or near the court, and be eligible for public offices. To further cement the alliance, it was also decided that Henry would marry Marguerite, daughter of Catherine de Medici and sister of the French King Charles IX. But on 9 June 1572, two months before the wedding was due to take place, Jeanne unexpectedly died. 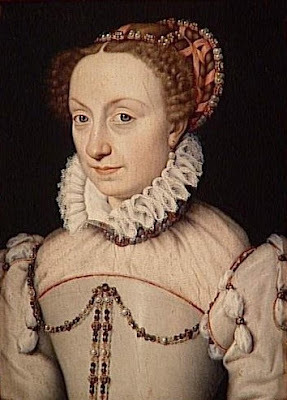 Although she died of tubercolosis, it was rumoured she was poisoned by Catherine de Medici who wanted everyone in the kingdom to be Catholic.